There has been a rise in the number of ATM frauds in recent times. Fraudsters use many tricks to steal your money. So, you got to be very careful, when you withdraw money from the ATM. In this blog, we will discuss some of the tricks used by fraudsters and tips to keep your money safe. Fraudsters fix tiny "pinhole cameras" on the ATM machine, to capture PIN numbers. These cameras will be well hidden. You won't be able to identify their location. In case of card skimming, fraudsters insert a small electronic device called a skimmer, in the ATM machine, to steal your card details. When the card runs through the skimmer, the device captures and stores your card information. This information is then copied on a blank card and used to withdraw cash and make purchases. Bulky slot: In case a skimmer has been inserted on top of the original card reader, an ATM slot would look slightly bulky or misaligned. Loose slot: If the card insertion slot looks shaky or loose, it means there is a Lebanese loop. Lebanese loop is a small plastic device with an arrow, that holds your card back in the machine. The fake keypad will be placed on the original keyboard of an ATM. The fake keypad captures the PIN and other data entered. 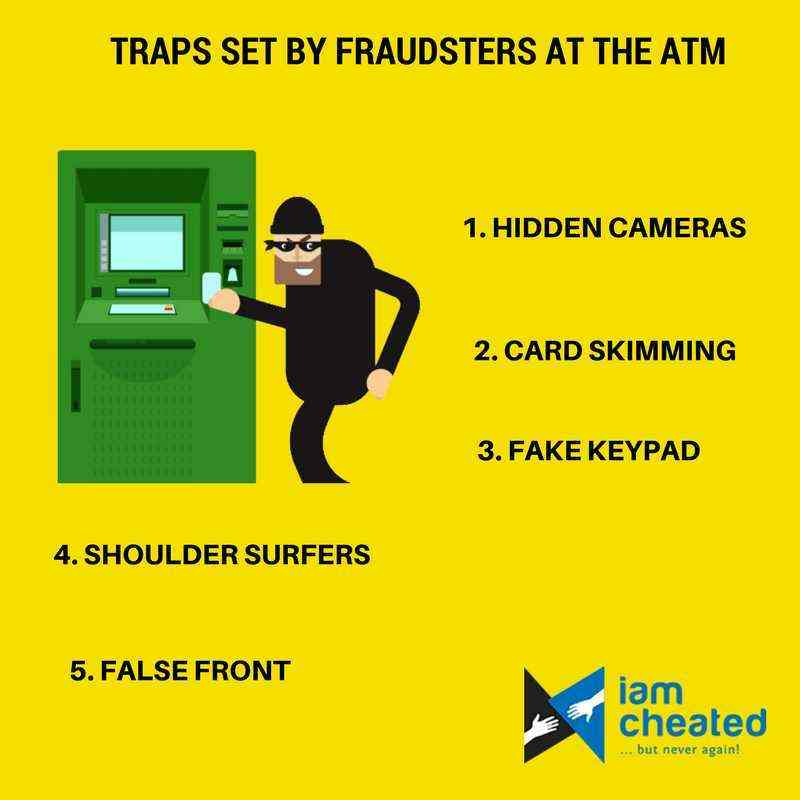 Shoulder surfers will be hiding in the ATM or outside. They either offer you help if your card is stuck, or peep over your shoulders to glance at your PIN. It is difficult to detect the fake front, as it completely covers the original ATM machine. Usually, the fake front is installed on top of the machine. The fake front allows scamsters to steal your card details. 1.Check the ATM before you withdraw money. Make sure no extra devices are attached to the ATM. Avoid using ATMs that look very old. 2. Always cover the keypad with your hands, while entering the PIN. This can help you escape shoulder surfers and the cameras attached nearby. 3. While withdrawing money, always stay focused and do not speak to strangers. Never take the help of strangers to withdraw cash. 4. Register with the SMS alert facility and stay informed on your banking transactions. 5. Change your ATM PIN regularly.